The United States Congress designated the Richland Creek Wilderness (map) in 1984 and it now has a total of 11,674 acres. All of this wilderness is located in Arkansas and is managed by the Forest Service. Beautiful Richland Creek traverses this area, cutting its way through a thick forest with abundant wildlife, secluded off-creek hideaways, and ridges that rise to towering vistas. Set within the Boston Mountains (which encompass most of Ozark National Forest), this Wilderness is a land of narrow valleys bordered by steep slopes and vertical limestone and sandstone bluffs rising as much as 100 feet above the drainages. Some of these stone formations contain fossilized remains of now extinct species. Richland Creek and Long Devil's Fork Creek meet near the very heart of this area on their eastward journey. Within one-quarter mile of these creeks, bluffs more than a mile long loom over Richland Creek. Beyond these bluffs lies land more typical of the Ozarks, an oak-hickory forest with scattered shortleaf pines and an understory of ferns, blueberries, dogwood, and blackhaw. Long since logged off, the land has no virgin timber, and the "trails" of are often old logging roads. 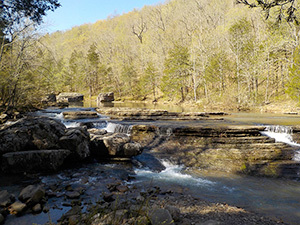 The scenery is some of the finest in the state, especially the first four miles of the Ozark Highlands Trail (OHT) after it leaves Richland Creek Campground and skirts the southern and eastern boundaries of the Wilderness. Unfortunately, according to the Ozark Highlands Trail Guide, the OHT misses "perhaps the most scenic spot in the state." To reach this plum destination, hike up the creek from the campground to Devil's Fork, then bushwhack up that drainage to Twin Falls, a total hike of about three miles. You'll find nothing finer in Arkansas. Planning to Visit the Richland Creek Wilderness? How to follow the seven standard Leave No Trace principles differs in different parts of the country (desert vs. Rocky Mountains). Click on any of the principles listed below to learn more about how they apply in the Richland Creek Wilderness.